Meat and potatoes go together like, well, meat and potatoes. Consolidate your cooking efforts and sear smoky goodness into your potatoes by grilling them while you grill your meat. Cook the potatoes entirely on your charcoal grill or quicken the grill time by partially cooking them before grilling. Grill the potatoes wrapped in foil to steam them, or leave them unwrapped for crispier skins. Open all the grill vents. Light the charcoal and let it heat until it is covered with gray ash, about 20 to 30 minutes. Spread the charcoal, double layered, in one half of the grill. Leave the other half of the grill free of charcoal. Scrub the grate clean with a grill brush and rub oil on it with a paper towel. Stab the potatoes several times with a fork. Rub the potato skin with olive oil, salt and seasonings of your choice. Wrap the potatoes with aluminum foil, if you want. Place the potatoes, wrapped or unwrapped, on the cool part of the grill, and close the lid. Grill them with indirect heat for 45 to 60 minutes or until they are tender when you puncture them with a fork. To make the skins crisper, remove the foil wrap and move the potatoes directly over the hot coals. Toast them for two or three minutes per side. Remove the potatoes from the grill. If they are unwrapped, cover them with foil to keep them warm. To reduce the grilling time, partially cook the potatoes by microwaving them for two to four minutes each. 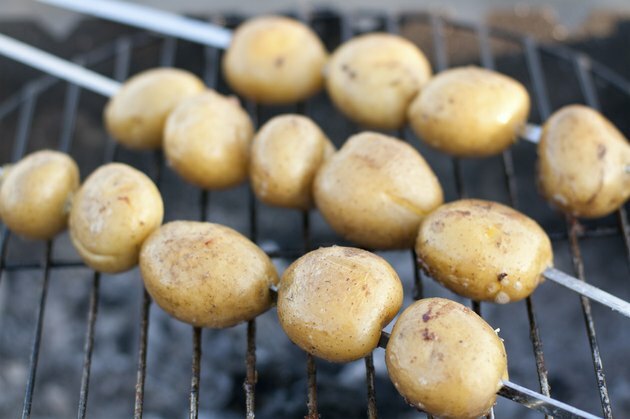 When you grill the potatoes, place them directly over the charcoal for two to three minutes per side. Leave them unwrapped for crisper skin. Parboil baby potatoes for 12 to 15 minutes and then stop the cooking by holding them under running water. Dry them with a clean towel. Toss them with olive oil and spices and skewer them. Place the skewers directly over hot coals and grill them for about five minutes total, turning as needed.